Notes: The name Rosherville comes from the Rosher family. Rosherville Station was built to serve the popular Rosherville Gardens but the gardens closed in 1910 and the station was downgraded to an unstaffed halt from June 17th 1928. The island platform was located in a cutting and was provided with a covered footbridge from the station buildings above with two wide staircases down to the platform to cater for the expected heavy traffic to the gardens. A signal box was set into a recess in the brick retaining wall on the down side of the station. The station house was sited some distance from the main building. The branch to Gravesend West Street opened on by the Gravesend Railway on 17th April 1886 with the first passenger services on the 10th of May 1886. All trains were through to/from London and there were express services linking with river steamers to Walton on the Naze, Clacton and Southend. There were intermediate stations Southfleet & Betsham and Rosherville, a third intermediate station, Longfield Halt opened on 1.7.1913. Following the closure of the Rosherville Gardens in 1910 most through London services were withdrawn and substituted with push pull trains to Farningham Road. The Gravesend Railway Company was taken over by the London Chatham and Dover on June 29th 1883. Passenger trains were withdrawn on 3rd August 1953 and the line singled in 1959. The freight service was withdrawn from 24th March 1968 but coal trains for the APCM (Blue Circle) cement works at Northfleet continued until 1976. 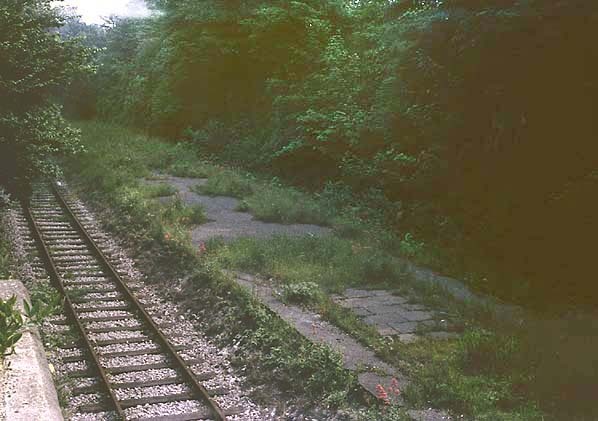 The trackbed was retained after closure, first by B.R., then Railtrack, and used to route a high voltage feeder cable to a converter/3rd rail supply station at Fawkham Junction for powering the main line. 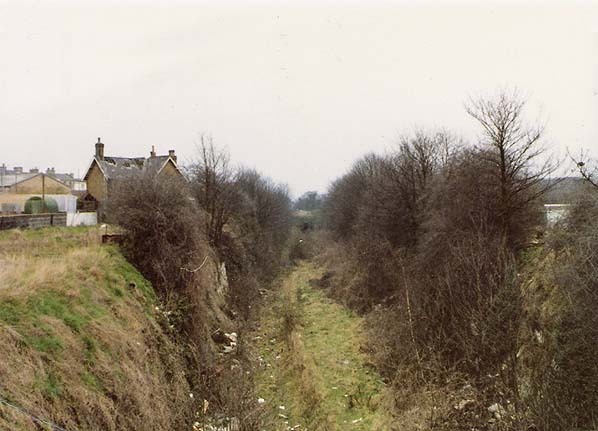 Part of the line south of Southfleet station has been used for the Channel Tunnel Rail Link. ISBN 0 85361 307 9. See also Kent Rail web site. 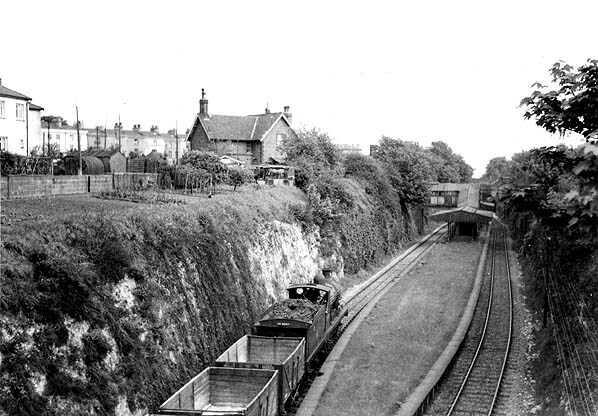 Rosherville Halt looking north east in the early 1960's. The wide covered footbridge is clearly visible. The stationmaster's house can be seen above the cutting. Although closed for nearly 30 years when this picture was taken the station appears in good condition. 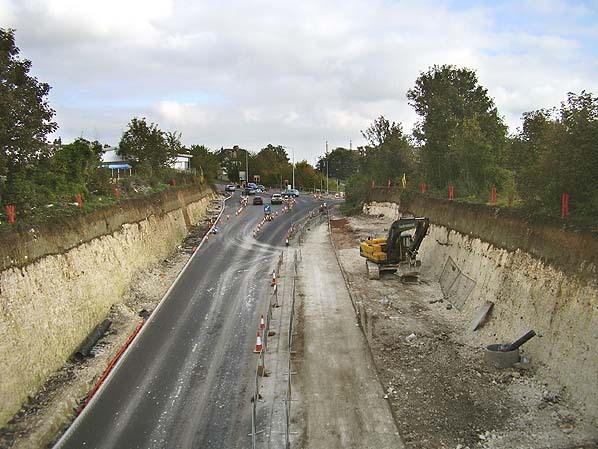 The site of Rosherville Halt in October 2007, the cutting has been widened to accommodate Thames Road. Taken from a similar viewpoint to the picture above.